With Doug Ford’s Tories systematically confiscating Toronto council’s capacity to govern – from political representation to transit planning and even our ability to locate safe injection sites as a public health response to the opioid crisis – it’s grimly instructive to observe how municipal officials seem to be retreating to those few domains where their authority is unlikely to be challenged from on high. As happened to democratically-elected school boards after Mike Harris in the mid-1990s erased their power to levy taxes, these institutions grew steadily more inward and irrelevant as their clout vanished. A generation later, with a mayor who flatly refuses to spend political capital to defend his city, perhaps this same fate awaits us, too — a council stripped of its right to plan invariably growing ever more obsessed with minutiae and inappropriate displays of vestigial power. Consider the case, last week, of Councillor Jaye Robinson’s motion to block a committee-approved staff recommendation automatically allowing homeowners to create entrances to secondary suites in the street-facing walls of their houses. This rule had been in place for almost a generation, the concession to ratepayer groups for a 1999 council decision allowing homeowners across the megacity to add legal secondary suites – mostly basement apartments – in their houses. Despite strict bans, tens of thousands of homeowners had been quietly renting out basement suites for decades, including in tony neighbourhoods like Lawrence Park, Robinson’s turf. The 1999 measure not only legalized the practice but increased the likelihood that these apartments would be fitted out with safety gear. Formal calls to legalize secondary suites first surfaced when Bob Rae was premier between 1990 and 1995; post-amalgamation, the City of Toronto, under Mel Lastman, was, relatively speaking, an early adopter. The arguments against basement apartments were legendarily misleading. Here’s Mississauga mayor Hazel McCallion, back in 1992, urging measures to crack down on an estimated 7,000 “illegal” basement flats: “If there are two families living in a house and one is using the basement apartment, we’re only getting tax revenue from the one family,” McCallion told the Toronto Star. “That pushes the burden on all of the taxpayers of Mississauga and there is an extra burden on the boards of education and all of our services.” I’m going to go out on a limb and suggest her concern had nothing whatsoever to do with the state of Mississauga’s finances. The telling detail, however, is that once Toronto council legalized secondary suites, many other municipalities followed; a door had been opened. Indeed, a survey of secondary suite policies in the 905 and some other Ontario municipalities, which was released with the aforementioned staff report, reveals that dishonest pretext arguments like McCallion’s are, officially, a thing of the past. What remains, however, is the lingering objection — formalized in zoning bylaws — to permitting secondary suites to be accessed via entrances facing the street. Backdoors, alleyways, even those dog-leg, partially concealed entrances tucked underneath front front porches – these are all okay. But the façade is sacrosanct. Of course, homeowners have long maintained secondary suites (or, in earlier times, rooms for lodgers). What’s more, this practice was once an entirely acceptable way for people, especially those with modest or lower incomes, to finance their dwellings. As a bonus, the existence of such suites came to provide plenty of inexpensive housing in established residential neighbourhoods. The ban on front entrances, moreover, may be a peculiarly Torontonian fetish. Montreal’s tri-level apartments, such as those found throughout the Plateau and Mile End, have multiple front-façade entrances and doors, including those on the ground floor, where the building’s owners often lived. Similarly with rowhouses in places like Brooklyn and London, where no one would bat an eyelid about a semi-basement suite, with stairs leading down from the street to a small entrance area. I’ve seen newly-built and well designed townhouses in Toronto equipped with a front-facade basement apartment entrances – steps down to that second front door, plus windows, all visible from the sidewalk. This configuration is apparently still possible, but remains subject to a minor variance application (plus costs and delays) instead of being provided as of right. The key difference, it must be stressed, is that the owner or the contractor must jump through bureaucratic hoops, appear before the Committee of Adjustment and seek the dispensation of his/her neighbours in order to proceed. Consequently, success is not assured. The strangeness of this requirement merits further comment: it’s not like we’re giving residential neighbourhoods over to squatters, perish the thought. The minor variance applications are sought by homeowners, which is to say that increasingly rarified portion of the population capable of buying a house in Toronto. They’re good for families trying to get a toehold in an outrageously over-priced housing market. They’re good for those residents of the city who must rent their housing. And they’re good for all those residential neighhourhoods that have seen a steady decline in population (and school enrollments) in recent years due to the double-whammy of demographics and real estate prices. These are all extant city-planning goals; look it up. And yet, 18 men and women on council decided it was important to ensure the reliance on secondary suites in Toronto remains a practice we dare not acknowledge to the street. When I tweeted about this absurd decision last week, several people responded by noting that homeowners or contractors will come up with workarounds – e.g., a single door that opens onto two internal entrances, as is common in older neighbourhoods downtown. And they are surely correct. 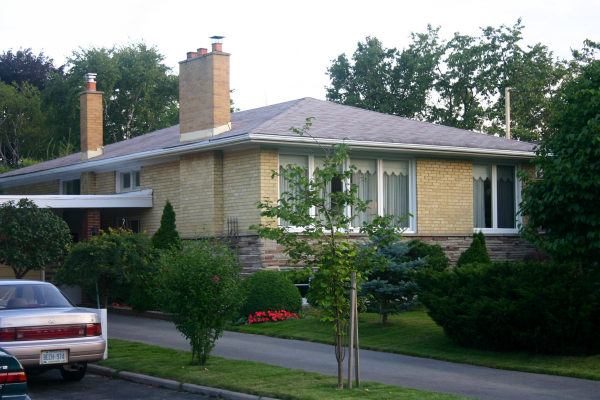 First, by giving homeowners the automatic right to manage the facades of their own properties (assuming council even has the authority to make such decision), Toronto politicians would have signaled that the long-standing practice of households deriving rental income from their dwellings is not only legitimate, but also essential to every neighbourhood’s economic character — especially now. Second, as happened with that landmark 1999 council decision legalizing secondary suites, Toronto’s policy choice would likely have spurred reform elsewhere in the 905 and beyond. In short, we blew this one on so many levels. But at least council got to flex its muscle in a grim time when our elected officials have fewer and fewer opportunities to demonstrate to voters that they’re actually taking care of Toronto’s business. A second door in front is a no-no. But a second garage door, a third garage door, a fourth garage door is fine. What’s wrong with this picture? A not seeing forest for the trees feel to this post. Real news is that council almost unanimously approved a big extension to the right to secondary suites all over the city, and removed parking requirements. And they basically allowed duplexes since the suites can be 45% of the building. These are all the things pro-density types have been calling for. Sure the doors thing is dumb but it’s just keeping in place existing regulations, totally minor drawback to big victory. There’s a habit in the pro-development crowd of getting hysterical over any little setback or opposition, while massive development is actually happening in tall and middle buildings all over the city. Ups and downs and opposition are part of life living in a democracy. Ride it out and focus on the big picture.